Who doesn’t love big statement jewels? Through this impressive creation draws inspiration lush greeneries and beautifully fresh flower wreaths. 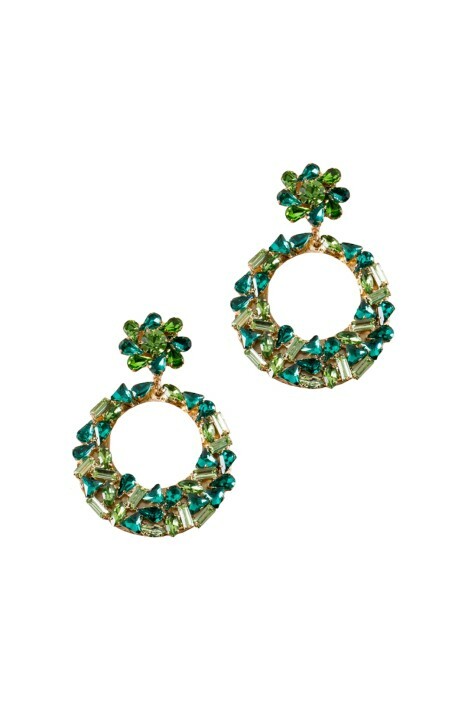 Crafted from faceted glass crystal jewels in shades of green, decorate this ornamental design to form a encrusted teardrop. Both girly and glam it would make a perfect addition to any lace number! Dress this fine work of art with pastel colours for a fantasy-filled daytime event. It’s also a great accent to style with a potential festival day outfit. Channel your inner festive field goddess in a mini ruffled playsuit available to rent. For more summery festival styles, read our blogs style guide.